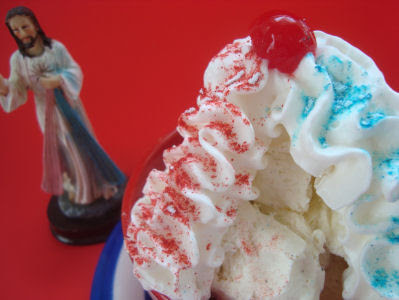 ... with a Divine Mercy Sundae! Divine Mercy Sunday is always the Sunday after Easter, and was instituted by Pope John Paul II in the Jubilee year (2000) at the mass for the canonization of St. Faustina. This day is extra special this year because Pope John Paul II is being beatified on May 1, 2011- Divine Mercy Sunday! 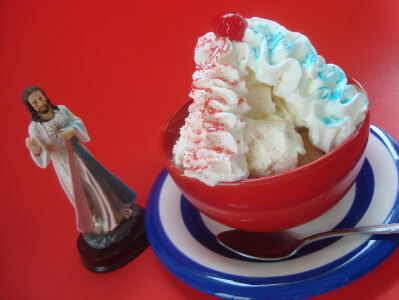 So we fashioned Divine Mercy ice cream Sundaes as a fun treat to celebrate this day! 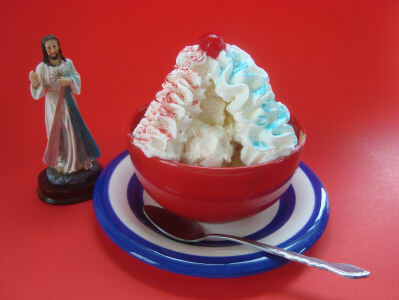 The ice cream was made to mirror the Divine Mercy image: "The two rays denote Blood and Water. The pale ray stands for the Water which makes souls righteous. The red ray stands for the Blood which is the life of souls. "- St. Faustina's diary. 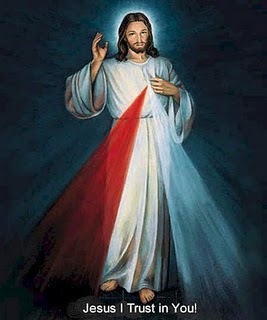 If you're crious, read more about the Divine Mercy Image. Scoop ice cream into a bowl, and create the rays with 2 long squirts of whipped cream. Embelish them with red and blue toppings of your choice. 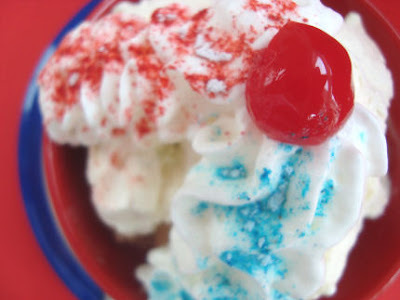 I sprinkled the whipped cream with red and blue kool-aid powder, but you could also use strawberries and blueberries, or make some red and blue sugar. 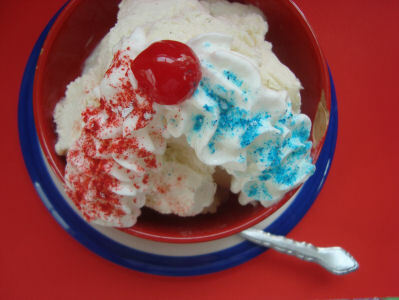 Also, you could just buy red white and blue sprinkles. My grocery store carries these year round! Also, I want to start having Creative Catholic Link ups on the first Friday of every month, and I'll be starting that this Friday. Bring your creative Catholic ideas so you can share them with everyone! Thanks for this idea Lacy! I just wanted to say thanks for sharing your ideas. We made your resurrection kit and the empty tomb this Easter and everyone really enjoyed both activities! Have a very blessed Easter season. Awesome ideas Lacy. thanks so much. I think I've got a liturgical folder on Divine Mercy Sunday. I'll have to post it. that I get actually enjoyed account your weblog posts. Anyway I will be subscribing on your augment or even I achievement you access constantly fast. if you are posting on additional online sites, I'd like to follow everything fresh you have to post. Could you make a list of the complete urls of all your shared pages like your twitter feed, Facebook page or linkedin profile? A handful of my blog audience have complained about my site not working correctly in Explorer but looks great in Chrome. Hi there! I realize this is somewhat off-topic but I needed to ask. I'd like to start a blog so I can share my own experience and views online. Please let me know if you have any kind of ideas or tips for brand new aspiring blog owners. Thankyou! Thanks to everyone who helps me spread the Icing! Free Catholic Preschool Lesssons- posting every Wednesday! My Book is for Sale!